I am of French heritage and my ancestors have worked as sheepdogs for centuries. Some of them also served with the Red Cross during World War I as ammunition carriers. I am intelligent and loyal to my people family, but if I am to live with children, it is much better for all of us if I am around children while I am still a very young puppy and grow up with them. I need lots of space for outdoor exercise. My coat, which is relatively long, comes in various colors and needs little more than regular brushing to keep it looking nice. When fully grown, I am between 23 and 27 inches tall (58.4 to 68.6 centimeters) and I weigh about 75 pounds (33.8 kilograms). 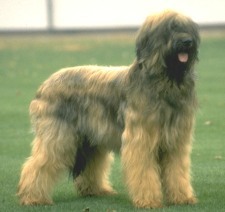 We have no Briard Breeders listed at this time. Click here to place your Briard Ad!